Double Chocolate Peanut Butter Brownie Loaf made with gluten, dairy and grain-free ingredients! A sweet and healthier dessert recipe! Currently sitting at my kitchen table eating a fat slice of this brownie loaf and loving life. There are a few things I have zero self control over. For anyone who thinks I portion my desserts and don’t overeat, you cray. 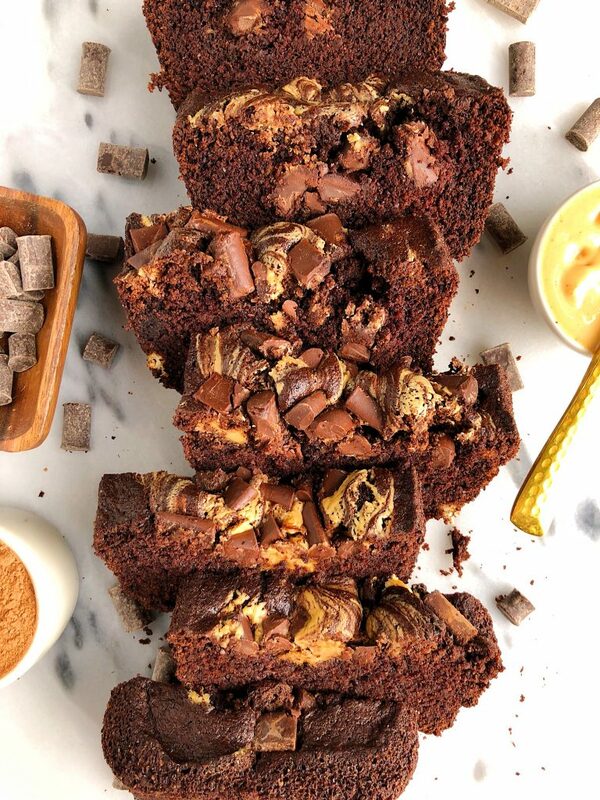 I am someone who cannot say no to anything chocolatey and this brownie loaf is unreal and hits the spot every single bite. Brownie loaf sounds pretty weird if you ask me, but that is the best way to describe this recipe. It tastes like a brownie but in a bread/loaf form. It has that moist-ness that cake has but the fudge-like taste and texture that brownies have too. The creamy dreamy peanut butter swirl on top and melt chocolate chips, while they look aesthetically pleasing, are the cherry on top of this epic loaf. The best part? I used Simple Mills Chocolate Muffin & Cake Mix as the base. The coconut sugar-sweetened, grain-free baking mix that is a staple in my pantry. I love love love Simple Mills everything (have you tried the new soft-baked cookies?!) but their cake mixes are the way to my heart. Anytime I make them for someone’s birthday or any occasion really (who needs a birthday to eat cake anyways), people are obsessed. 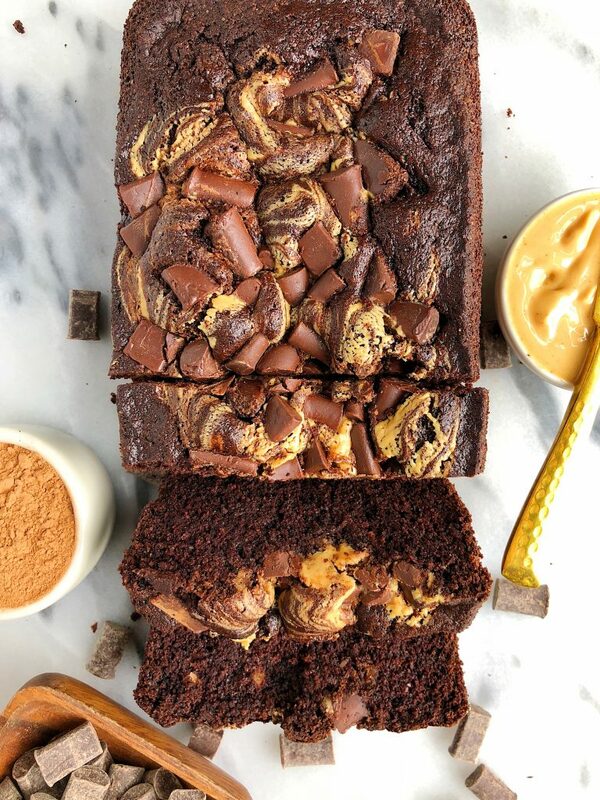 I brought some of this Double Chocolate Peanut Butter Brownie Loaf to my brother-in-law’s for dessert one night and it was a hit with my family too. Dip some of this into almond milk or spread some coconut yogurt on top and you are golden! You can also turn this recipe into muffins by using a muffin tin if loaf isn’t your style or you don’t have a bread mold. I hope you guys love this recipe as much as I do. Don’t forget to tag me if you make it and share on Instagram! 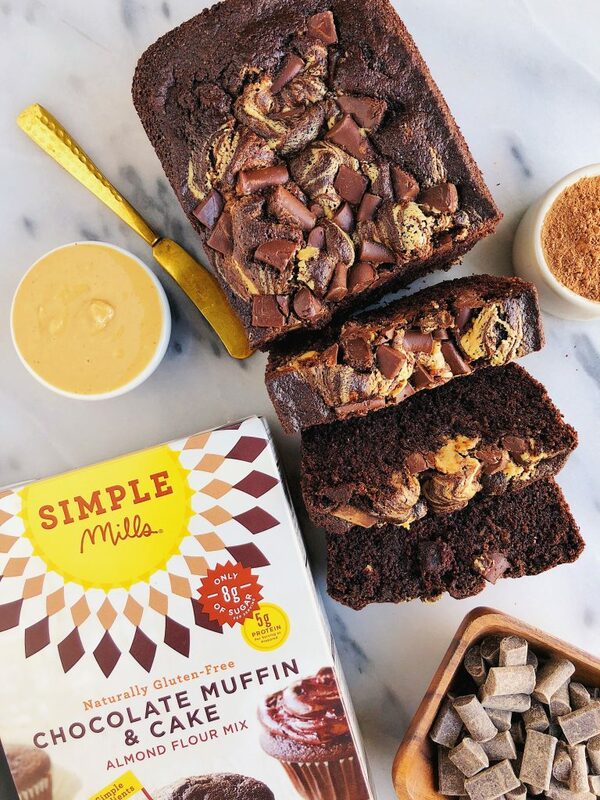 Here are a few of my other favorite recipes featuring Simple Mills on the blog. Or you can be lazy and bring these snickerdoodles from Simple Mills because they are AMAZING! Store on counter in airtight container for a couple of days or fridge for 5 days! Thanks Rachel! I can see it now. Looks delicious Rachel!! Can’t wait to make this! I don’t see the instructions though..just what is needed. Maybe it is not coming up for me. how odd!! its is coming up for me. LMK if you still can’t see!